HoriZen system proposes you to create your own privacy screen, thanks to multiple elements combine together. You can mix design, materials, colours, lights, boards to assemble, panels to combine.... Soon, a specific tool will help you to compose your panels, depending on your need and creativity. You'll get at the end of your configuration a full description of what is needed to compose your system. Guaranteed 10 years, this range benefits from a large documentation to help you to erect and maintain your privacy screen for long. Check out our videos and enclosed documentation. 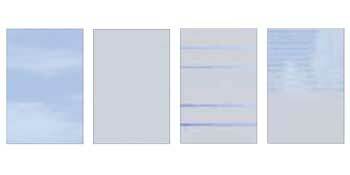 three different boards range are proposed to compose your privacy screen. 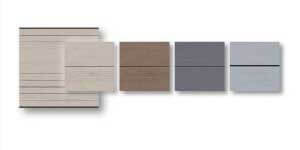 - HoriZen Composite Platinum: Co-extruded WPC boards, available in brown and grey colours. Each board is 1780 mm x 150 mm high. Both sides are identicals. Each pack is composed of 12 boards. HoriZen Platinium range has an additional layer which gives extra protection to your boards against stains from water and dirt. 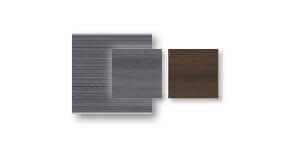 These boards are fully manufactured in aluminium, which gives a modern look to your privacy screen. They receive an additional coating in polyester and are available in 2 colours: silver and anthracite. Boards dimensions are 1780 mm width x 150 mm high. Each pack is composed of 12 boards. They are available in 1790 mm width and two different heights: 150 or 300 mm. Only Bubble, Gamma and Decor-Mat can be resized to a different width. Delta and Theta are not resizable. Give an additional touch to your privacy screen, with led bars integrated into your fence. You can position your led bars where you want, in between your boards, and surround your space with a cosy atmosphere. 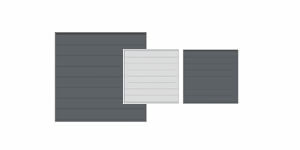 6 bars in series can be connected, and bars can be cut to your panel width dimension. Transformers need to be ordered separately depending on your configuration. Please refer to specific assortment table. They are full screens, available in different size and forms, made of 2 aluminium sheets with Polyurethane in between. 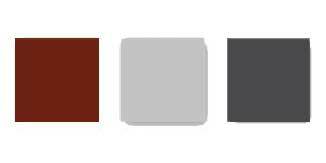 They are coated with a thermolacquered painting available in 3 colours: red, titan grey and slate grey. Two references are designed with slots in the upper part to create variation in your composition. Panel thickness is 6 mm. 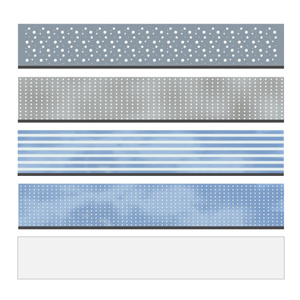 Check out our full assortment and lets combined them with other panels. HoriZen Laminate system panels are resizable. - Beta: a mat glass panel gradually becoming transparent towards to top of the panel. Our HoriZen Glass panels are 8 mm thickness. Special Glass panels can be cut to personalized dimensions (square or rectangular dimensions only). 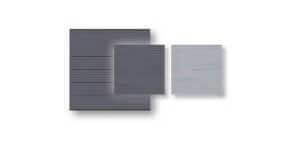 They are both with polyester coated finishing available in two colours: Silver and Anthracite. Compatible with Composite Classic, XL, Platinum boards and Aluminium board system. As from the moment your composition is made of designed thinner board, you'll need to use the Clamp system post. 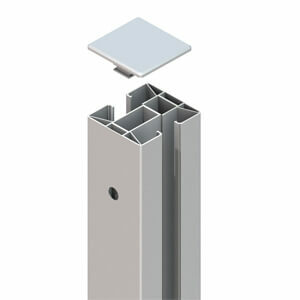 This post is 73x66 mm section and is delivered with premounted plastic cap and finishing profile. Both installations are possible: in concrete or with a base plate. With angle post, you can install your composition with a variable angle from 75° up to 180°. This post is compatible with all HoriZen system thanks to variable spacing slots which accept different infills width. 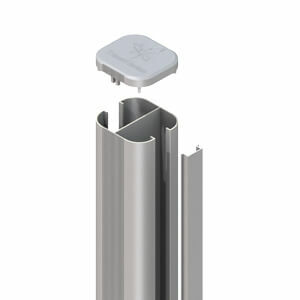 This post is 77 x 74-84 mm and is delivered with two aluminium finishing profiles and two different caps to fit the width of your post (74 or 84). With angle post, you can install screens at 90° angle. HoriZen Clamp post can be dressed with an additional cover in stainless steel for a brilliant and modern look. (1) Each box is delivered with top & bottom aluminum profile (2) Post can be rezised if your privacy screen is shorter. (1) Check each type correspondance in below additionnal information (2) Post can be rezised if your privacy screen is shorter.